2017 is upon us and it is time to consider if you are prepared for the upcoming changes to employment law. Here are seven questions to ask yourself and resources to be sure you are ready to take off in 2017. Are your wages in line with the increase in minimum wage and the exempt status threshold? As I hope you know by now, employers will be dealing with changing wage regulations for the foreseeable future, so set a plan that can be used as a pattern for the future. Your employees will feel better supported and trust you if you are consistent in how you handle this from year to year. Additionally, consistency will make your life less stressful if you and everyone else knows what to except each year. Is your Employee Handbook (and all related employee documentation) up to date with the new 2017 California Labor Laws? Best practice is to update your Employee Handbook every six months, annually at a minimum, to mitigate any exposure. Contact your insurance broker or associations you belong to for a 2017 Employee Handbook Template. To make it easy, find a template you like and stick to it each year, schedule this important activity to ensure it gets done. Make sure you communicate the changes to your employees, and that the supervisory staff clearly understand what they need to do to protect your organization and themselves. Employee Advisory Council Employment Law Update, Friday, February 10th in Paso Robles. Information and details will be coming soon. Does your Employment Application include questions about convictions? Review this carefully to be sure you are not at risk of asking anything illegal. As with all questions during the application and interview process, only ask questions that are directly related to the job. CalChamber has a solid Employment Application Template in long and short form, take a look and revise yours as necessary. Is this the year for your mandatory AB 1825 Anti-Harassment Training? If so, what is your plan? Marcove Executive Training can help, we have an affordable, off the shelf AB 1825 compliant training program ready to go whenever you need it. 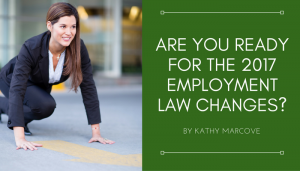 Call me at 805-235-3518 or write kathy@marcovetrainig.com to schedule this important training to keep you in compliance with California Labor Law.